And now AFTERNOON FREETOUR at 5 p.m! Mallorca Free Tour is for the general public and with small groups. Just discover the history and emblematic buildings of the old city of Palma! Furthemore you will learn about secret places, corners and Majorcan lifestyle. Ask to your guide the best places to enjoy the island! No booking reservation is required! We offer a daily tour (except Sundays) You don’t need to sign up! 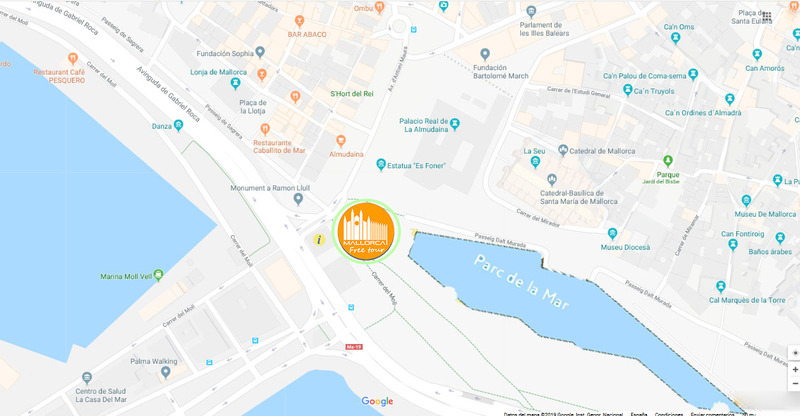 just come to the meeting point in Parc de la Mar, in front of the tourist office. But we will accept your tips! No need to book! Does not matter if it’s raining or snowing, we will always be at our meeting point! It’s summer, so do not forget cold water and suncream! Expert local guides are entirely devoted with passion and commitment the whole year and full time. Look for the orange T-shirts and umbrella! You don’t need to book any tickets! Just come at 11 a.m. in front of the tourism office in Parc de la Mar, just below the Cathedral. If you come by bus from Palma, you can check the lines and timetables clicking blue button. Eulàlia, historian and Carlos, licensed in Tourism, they work full time doing the Free Tour and walking tours since 2014. One of the things we like most is to receive reviews like those ones. We had an extremely informative yet relaxed tour today with Carlos. Our tour was in English and his colleague did a similar tour in Spanish. We have been to Palma before and visited some of the places we were taken to but learned MANY more things about the history of the old town. Well worth doing and took only 2 hours. Why do we offer a Free Tour? A Free Tour for everybody. In our company we believe that all visitors have the right to enjoy a walking tour and learn about the most important historical places of the old town and your budget won’t be a problem. The Free Tour works exclusively on tips, our guides are always motivated and ready to satisfy all your expectations, this will also guarantee the quality of the walking tour. In that way, you can choose freely what you want to tip the guide depending on your budget and your level of satisfaction. Our tour is offered in two languages: Spanish and English. It takes two hours and it starts at 11 a.m in front of the Tourist office, it is located in Parc de la Mar, just down the Cathedral (more information in the map). What can we see in Palma de Mallorca? END: Plaza España, where the tour finishes. The Mallorca free walking tour will answer you the questions what do to and what to see in Mallorca during your holidays on the island. We suggest you start your journey with us, Mallorca Free Tour and learn about culture and history of Mallorca and start feeling the city and the island as an well-known traveller, who can discover the best places to eat, anectodes to explain years later and feel the city as a local! What to see with Mallorca Free Tour? Mallorca Free Tour organises walking tours through the old town of Palma and you will discover what to see and what to do in Palma city and you will learn about our history. Since the foundation of the roman city of Palmaria, its transformation in Madina Mayurqa, one of the greatest cities of Al-Andalus and the Christian reconquest by Jaume I and it became Ciutat de Mallorca, the capital of the Mallorcan Kingdom. Thanks to this free walkig tour, you will visit the main monuments and places of Palma, streets, buildings and hidden places. A great tour, full of history, anecdotes, curiosities, legends and more thanks to Mallorca Free Tour. Let’s start the tour! Parc de la Mar, the meeting point. We meet in front of the Tourism Information Office in Parc de la Mar, close to the Cathedral, at 11 a.m. Are you ready to start and discover Palma de Mallorca?. After the construction of the avenue and the Paseo Marítimo (seaside promenade) there was a huge empty area between the new avenue and the renaissance Wall. For preserving the beautiful memory of the Mediterraean sea lapping the walls and the reflection of the Cathedral above the sea, the Parc de la Mar was built. The iconic Parc de la Mar is, nowadays, the place where almost all the events take place. It was opened in 1984 after many demostrations and the people’s preassure shouting: Parc si, Parking no! For its construcction, some personalities, such as Joan Miró, took part. The Parc de la Mar follows the wall and it has a surface of almost 9 hectare, the same than 9 football stadium. To enjoy the Parc and see Palma, we are waiting for you at 11 a.m in Mallorca Free Tour. After the Parc de la Mar, in the palatial gardens of S’Hort des Rei, in front of the sculture Es Foner (slinger) we will do an historical introduction about the evolutions of the city of Palma and then we will stop in front of the Almudaina Palace. Almudaina is the royal palace or the muslim citadel of Palma and nowadays it is National Heritage. In Arabic Almudaina means “citadel” or “fortress”. That area was used by romans and muslims and even since the prehistory times! The current palace dates from 1281 and it is a modification of the muslim citadel..
After the Christian conquest of Mallorca by Jaume I, it became the headquarter of the goverment, almost all the moorish part was destroyed and it became a gothic palace. The tower of the Angel is the highest tower and there is an angel working as a weather-vane. It is still working and for that reason in Palma came up a saying: Te pareixes a s’angel del Palau, that means “you seem like the angel of the Palace” and refers to bipolar people. Another anectote is, such as the Orient Palace and the Zarzuela Palace both in Madrid, Almudaina Palace is the official summer residence of the royal family, however they always stay in Marivent Palace and Almudaina Palace is used for receptions and ceremoinies. If you want to know more anectotes and details about the Almudaina Palace and see Palma, we wait you at 11 a.m! 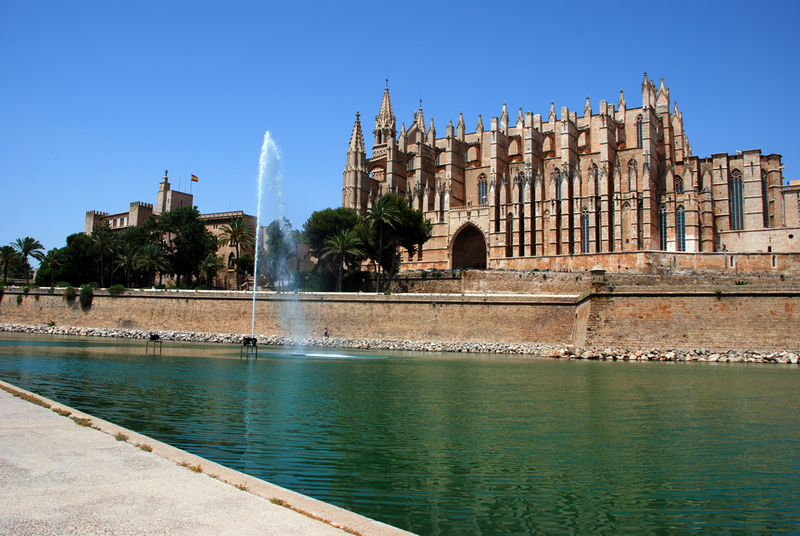 Our next stop is located in front of the Palace: the Cathedral of Mallorca. The Cathedral of Santa Maria of Palma de Mallorca, also called the Cathedral of Mallorca, the Cathedral of the Sea, Cathedral of the Light and the Seo in mallorcan, is full of anecdotes and curiosities. One of the most stunning details is its reflection above the sea water, being the only one in the world. Its construcction starts with Jaume I, King of Aragon and earl of Barcelona, after the Christian conquest in 1229. Jaume I promised to Virgin Mary that if he could conquered the island he would built the most stunning temple to her, for that reason he destroyed the former mosque and built our Cathedral, one of the most beautiful cathedrals in the world. The construcction of the Cathedral took over 300 years, it was finished in 1601. It has been restored several times, but the Gaudi’s intervention in 1904 and Miquel Barceló’s in 2007 are the most important restorations. The rosewindow stands out for its size, it ‘s known as “ the Eye of the Gothic” and it is about 13 meters diameter, the biggest one of all the cathedrals of the Mediterranean area. It is formed by 1.236 colour glasses and offers some magical effects, for instance the “Vuit” (the eight): the 2nd February and the 11th November, during the sunrise, the biggest rosewindow is projected below the other rosewindow, located on the west façade forming a magical eight. We could write thousand lines about the Cathedral, but we prefer explain more things about this amazing building during our free tour. Located very close to the Cathedral, the jewish quarter is known for its serenity, peace and quietness. During the Middle and part of the Modern Age, in Palma there were two calls jueus, that refers to the jewish quarter of the Aragon Kingdom. The Jewish community of Mallorca came to have about three thousand people (approximately 15% of the total population of the city) during some years of the 14th Century. In 1391 the peasant riot ended with the assault on the Jewish neighborhood of the city of Mallorca. Finally, during the “Semana Santa” in 1435 the Jewish community dissapeared. Since the 17th Century, the converted Jews, called Xuetes (used as an insult), were marked until the first half of the 20th century, preventing marriages and relationships. A lot of history, mysteries and anecdotes surround the Jewish community in Palma de Mallorca. Discover them with Mallorca Free Tour. The old town of Palma, is characterized by an collection of large and small courtyards or patios. Palma is considered as the city of the courtyards. The old town would not be the same without the patios of the stately homes, a symbol of power and social status. Writers and chroniclers agree in remarking that the architecture of Palma has in these urban houses one of the most important references. Mallorca, as an island that enjoys a strategic location in the Mediterranean Sea, adopted the construction of residences with courtyards as the most natural way to build, whose origins are based on the houses of Roman, Muslim and Catalan cultures. The patio is a space located halfway between the street and the house, they all maintained a similar structure and had a social function of “open doors”. The history of Palma’s courtyards dates back to the 13th Century. The oldest patio dates back to the 14th-15th Centuries. A document from the beginnig of the 19th Century extracted from the Public Archive of Palma collects more than 500. Today they have become institutional buildings, museums and, in many cases, independent houses where the Majorcans live. They certainly caused and continue to cause admiration in those who have the pleasure to stop to appreciate it like the visitors to the Free Tour. After visiting the Mallorcan courtyards, we stop in front of the Parish Church of Santa Eulàlia the ancientest parish church of the Baleric Islands and one the parishes or districts in which “Ciutat de Mallorques”was divided. It receives the name of the patron saint of Barcelona, quite appreciated by the Catalans. For us, it is an important church of our history and for the Kingdom of Majorca because was where Jaume II and Jaume III were crowned. It was built in the 13th century, but its façade and bell tower were remodeled during the 19th Century, due the slightly earthquake in Mallorca in 1851. The terraces surrounding the church show us a large number of gargoyles, representatives figures of the Middle Age: demons, dragons or fantastic beasts used to protect teh temple and frighten sinners. If you want to see the fear they give, you can check out in Mallorca Free Tour. We move to our next stop: the center of Palma. The City hall of Palma is located in the emblematic Plaza de Cort, where firstly the Hospital of San Andrés was placed, later it became the House of the Court of the Kingdom of Majorca and nowadays the City hall. The Plaza de Cort is considered the kilometer 0 of Majorca, the origin of the roads. In the center we find the mythical and immense olive tree of Cort catalogued and protected by law and also transplanted here in 1989 from Pollensa as a symbol of peace. The current building of the City hall was built between the years 1649 and 1680 as a traditional Mallorcan manor house on the countryside: three decreasing floors topped with a stunning corvel. On the facade you can contemplate the balcony, the Rellotge d’en Figuera (clock of Figuera) or the “Bench of lazybones”. Discover more of the city political life in Majorca Free Tour. Most of the Mallorcan modernist buildings follow the catalan modernism trend. Perhaps the most amazing modernist building of Palma. Located in Plaza Weyler, it was built in 1903 by the architect Lluís Domènech i Montaner. The Grand Hotel was the most luxurious in Spain, until the inauguration of the Ritz (Madrid) in 1910. Innovations and luxuries include: elevator, steam heating, running water and electricity. It remembers us to Casa Batlló in Barcelona (Gaudi’s building). His promoter was José Forteza-Rey who worked as a goldsmith of the cathedral at the same time that Gaudí made the reform (1904-1914). The history of the building is quite curious: José Forteza Rey built the building for his sons: a pharmacy on the ground floor; a dental clinic on the first floor and the rest as a private residence, the mezzanine was reserved for his own house. It emphasizes the decorative treatment, the polychrome ceramics of the Mallorcan factory “La Roqueta” and the monstrous or rather painful and suffering face, flanked by two winged dragons located on the second floor and above, the dentist sign “Dental clinic I. F. Rey “, an effective and artistic publicity, associating evil with the remedy. Nearby the house Forteza Rey, we found the building: l’Àguila. It was built in 1908 by the architect Gaspar Bennazar, popularly known as “S’Arquitecte”, among his works also stand out S’Escorxador and the Paseo Sagrera. The Aguila building has been used as an shoopping center. Nowadays, it has been planned to become a boutique hotel. Discover more about the old city architecture and what to see in Mallorca with our free walking tour. Very close to the City hall is the Plaza Mayor, the main square of Palma. There is a local saying that “All roads lead to Plaza Mayor” as “all roads lead to Rome”, and it is the current center of the city of Palma. From the Plaza Mayor start the main and busy city streets: San Miguel, Jaime II, via Sindicato, where there are many shops of traditional products, local and jewellery. On Mondays, Fridays and Saturdays there is a handcraft market. Surrounded by buildings of the 14th Century, it was where the headquarter of the Inquisition was located until its definitive abolition in 1823, it was a place so dark and lugubrious that local people used to called the ”Black House”. Later, the square became a market and after the Civil War it became a square with fountains and gardens. The square is linked to the Rambla promenade by a staircase. In 1969, the city Council approves the “Great Reform”, creating the underground shooping center and parking. Discover more about the history of Palma and what to see in Mallorca with our Free Tour. San Miguel Street is one of the main shopping streets in the center of Palma. It is a narrow and long street and one of the busiest pedestrian streets. It belongs to the most traditional and cosy shopping area, next to the Oms Street and Las Ramblas. It could be considered an open-air shopping centre, with plenty of shops, clothing, footwear, accessories, perfumeries, souvenirs, fabrics and Mallorcan embroideries. In San Miguel there are local and traditional shops of yesterday such as the historic Valldemossa Embroidery and the well-known Camper shoeshop, and important brands such as Desigual, Mango and Sfera. In the middle of calle Sant Miquel you will find this parish church, one of the five parish churches of Palma (Santa Eulàlia, Sant Miquel, Sant Jaume, Santa Creu and Sant Nicolau). Some historians say that the main mosque of the muslim city of Madina Mayurqa was located right here. According to the tradition, during the Christian reconquest of the island, the Archangel Warrior San Miguel appeared helping the Christians and after the conquest they built a church in honor of Sant Miquel. The carved portal, the bell tower and the church plant are the only architectural elements that have been preserved from the ancient Gothic church. In 1632 the church suffered a refurbishing and it became a Baroque style church. Discover more about the churches of Palma and what to see in Mallorca with our free walking tour. After walking through the old town we come to the Olivar Market. The markets have become one of the most attractive parts of many cities and the “Mercat de L’Olivar” is the largest and most complete municipal market in Palma. The building was built in 1951 and it is a illuminated building following the mediterranean architecture trends. Before to become the market, here it was located the Verge de l’Olivar nunnery. Variat means “mix” and it is a combination of dishes from Mallorcan cuisine in the same dish, you can taste it e in this market, being one of the main reasons to visit it. Discover more about the mallorcan food and what to see in Mallorca with our Free Tour. As in other cities, the Plaza de España is characterized as a neuralgic point of Palma communications. Many avenues, streets and squares converge here, it is a perfect point to finish the tour of Mallorca Free Tour and to go to eat to any of the restaurants that we found in the surroundings. Depending on your tastes, do not hesitate to ask our guides where to go to eat well. In Plaza España is the equestrian statue in honor of Jaime I, the Conqueror, it was inaugurated the January 20, 1927. It is said that depending on how the legs of the horse are placed, you can know how the horseman died: the four on the ground floor would mean natural death, one leg raised died due an illness, disease or wounded in a battle and two legs raised mean that the horseman died in combat. But it seems that this is but a myth. Discover more stories, history and legends with our free walking tour. Differents plans to enjoy your stay on the island. Discover beaches, places to eat, hidden places, etc. Mallorca Free Tour is coming back next 1st March. IS THERE A FREE WALKING TOUR IN PALMA DE MALLORCA? FREE WALKING TOUR IN PALMA DE MALLORCA. SOON, WE BEGIN THE SEASON!!! ¡¡¡¿¿¿A FREE TOUR IN PALMA???!!! Our company was born with the idea that in Mallorca is not just sun and beach. We invite everybody to discover the city of Palma de Mallorca and try our walking tours with the best official and local guides. We believe that the best option to discover a city is walking around. Our guides will explain you history, customs and traditions of this wonderful island. Moreover, our walking tours mixes different anecdotes, legends and curiosities about our local culture. Our guides are properly certified and qualified according to the local regulation of the Balearic Islands. They will show you Palma de Mallorca in a fun and different way including anecdotes, curiosities and history of every corner of the town. Furthemore they will be pleased to help you and giving you advices for your stay in Mallorca.